Welcome to the first post on the new Ironstone Blog. Maybe its an obvious starting point, but one of the commonest questions Ironstone get (and all over guitar Forums too! ), concerns the differences in tone of Stratocaster vs Telecaster. Now just to be clear, there are many subtle variants at work, but logically the Ironstone focus is on the key differences between the pickups themselves. A bit of digging soon reveals that it is the differences in construction that drives the very different tonal qualities. And there are some other ways to illustrate the effect these design differences have other than just listening to tone. And that sparked off the thinking behind the Ironstone support page detailing Stratocaster vs Telecaster pickup comparisons. 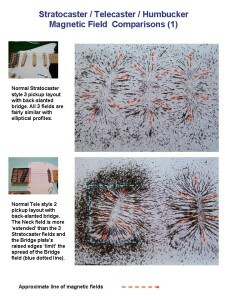 So click the Full Details link below and discover the hidden world of guitar pickup magnetic fields!